The microSD card on the NB2AS is connected to the SPI port. Six I/O lines are required. Three SPI lines (MOSI, MISO, SCK), a chip-select line (CS) a card-detect line (CD) and a power-enable (USD_PWR). 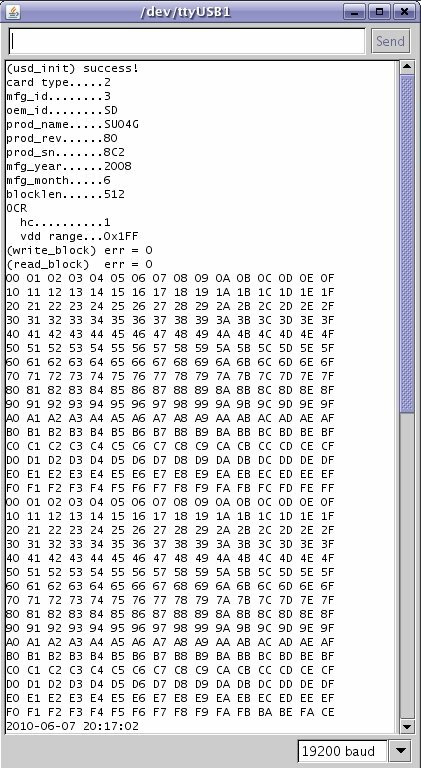 This microSD demo sketch demonstrates the intialization of the microSD card, readback of the card identifcation (CID) register and read/write of a block. After the initialization is complete the RTC will generate an interrupt every time the seconds count is equal to twenty. Each time the interrupt occurs the time will be written to the microSD card. 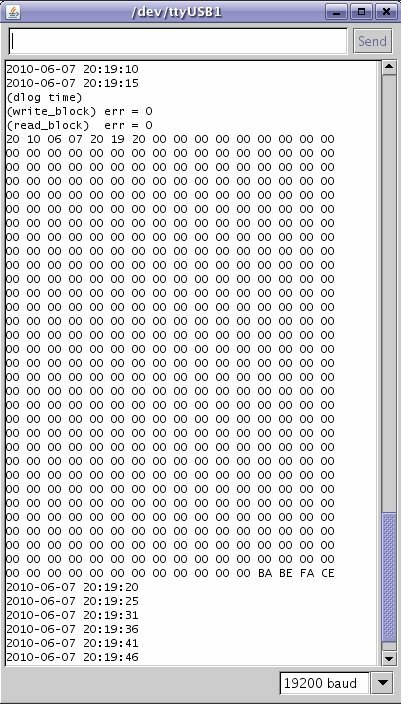 The time is written in a BCD format for ease of debugging. The screenshot on the right shows the output from the intialization sequence. The CID is output after the initialization, a write command is executed followed by a read command. The data that is read is output. The screenshot on the bottom right shows the output of a dlog command. The time is datalogged in a BCD format and then the block is readback and output. All unused bytes are filled with zeros. // by calling usd_card_inserted() or usd_card_removed(). // The main application needs to do the "appropriate"
// when the power is off.